Birthday Cake Popcorn: An Alternative to Cake! I love popcorn! It’s such an easy, light snack. Since I got rid of my microwave 2 years ago, I avoided making it, thinking it would be a big “to do” in a pot. I soon realized that it’s really the simplest, most delicious way to make popcorn and it is way more fun than doing it in the microwave! I use coconut oil, and a dash of salt on most days, but when there is a special occasion, I have a lot of fun with it. There are so many delicious ways to turn your everyday popcorn into a party in your mouth (check out this post), and this birthday cake popcorn is no exception! I recently found myself in need of a lighter, and somewhat healthier alternative to cake, but I still wanted it to be fun and special. So, when I came across this post about birthday cake popcorn, I was really excited to give it a try. It was a huge (addictive) success with the masses, and took me no more than 15 minutes to put together! • 1 1/2 cups classic white cake mix of your choice. In a large pot with a lid, over medium high heat, add 1/4 cup of coconut oil and 3 kernels. Wait until the 3 little kernels pop (these are your testers). Remove them from the pot, add the kernels to the oil with a sprinkle of sea salt and shake it up. Cover and let that pop, while shaking regularly to ensure every little kernel gets a chance to pop. This should take about 2 min. When you start to hear the popping slow down, take off the heat and let it rest. You can do this in the microwave, but since I don’t have one, I boil a little bit of water in a pot and put a glass bowl overtop. Mix the white chocolate and the remaining 1/4 cup of coconut oil to the bowl, and stir with a spatula until nice and smooth. Remove the chocolate mixture from the heat and add to it the 1 1/2 cups of cake mix. Stir well until there are no lumps left. Pour this cake batter, chocolate mixture all over the popcorn that has been resting in the pot. Add the 1/4 cup of sprinkles and fold over until well combined. On a cookie sheet lined with parchment paper, spread the popcorn out evenly and let it chill for at least an hour. You may need 2 baking sheets for this recipe. Step 6: Try your best not to eat it all! Do you have any fun popcorn recipes to share? I love a good DIY, and i’ve done a few for my new place that I am hoping to post on here sometime soon. I will admit that I came to the realization while making my Ikea Hack nightstand (coming soon), that you don’t always save money. After buying all the supplies, and spending the time doing the work, I realized that I really could have just bought a finished piece at Ikea for the same price. That being said, I really enjoyed the process and the challenge of saying that I can make something, having a vision of how it will turn out and then actually doing it and being proud of the results. It’s thrilling to me, but I know it’s not for everyone. Plus with a DIY, you then have something unique, that you can’t find in a store or anyone else’s home. I don’t know, it really depends how much time you have on your hands and how much importance you put on making things by hand, but personally I know that even if it’s hard work, I am going to keep DIYing because I find it so rewarding and fun! I have posted on here a few times this week after being MIA for a while. I guess thats my MO. 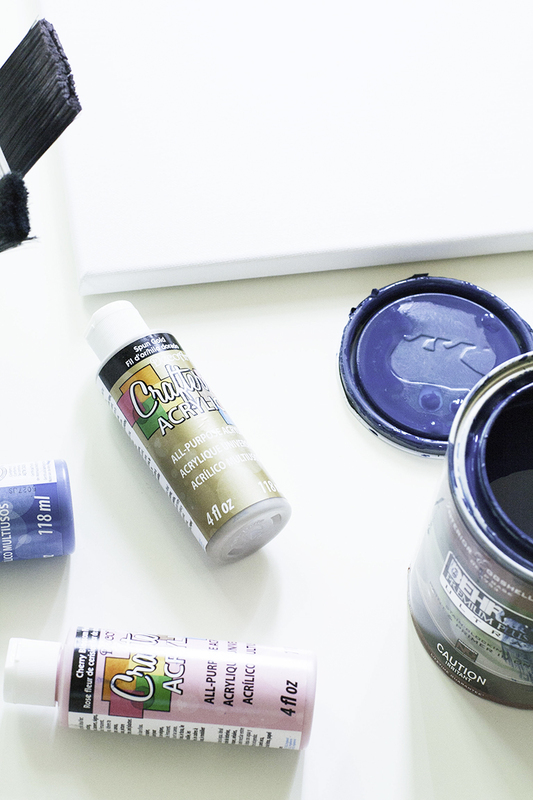 I get bursts of creativity, and ideas, and energy to make blog posts and then I go into hibernation for a while. I know that I should probably hold off on posting this project for a little while to space out my work, but I’m way too excited, because I really, really love how this project turned out and I feel like anyone can do something like it. When I moved into my new place I made two decisions. The first was that I wanted to start being more minimalistic. After reading Marie Kondo’s book; The Life Changing Magic of Tidying up, the idea of only holding onto the things in my life that I loved resonated with me. So when I moved, I only brought the stuff that made me smile into my home, and have been taking my time filling it, so as not to buy unnecessary items. The second thing I decided was that I wanted to make a lot of my own art. In my last apartment I had some of my photography printed and I framed them in simple frames to go above the couch, then over the TV in NYC. I think I might do that again soon, but I also wanted to try my hand at painting because I not only love it but I find it so therapeutic. I started doing a little research to find what pieces made my heart flutter. I went on Pinterest and pinned a bunch of art and then tried to zero in on what I really liked about them. 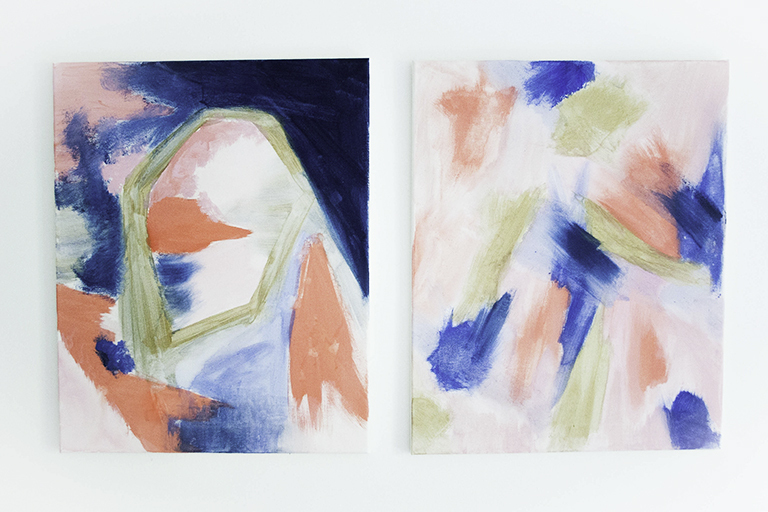 I realized I was being drawn to abstract art, simple lines and feminine colours. With that idea in my mind I went to the dollar store (yep, this DIY is really low cost, high impact!) and bought brushes, paint and canvases. This whole project cost me under $20.00, and I ended up with two pieces of personalized art, one extra canvas that I still need to paint, and a ton of paint and supplies left over for future projects. Score! 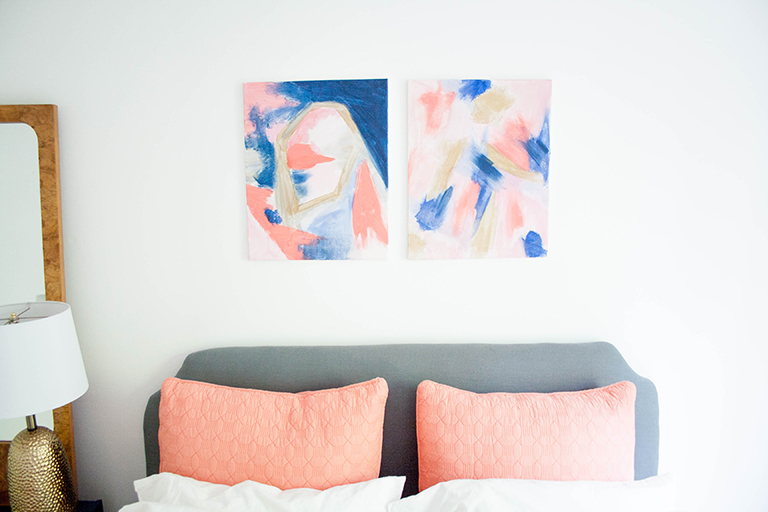 My bedroom has pops of coral, navy, gold and white, so I wanted to use those tones in the artwork to tie the whole room together. I used navy paint from my Ikea Hack Nightstand (which I will get around to posting about as soon as I get to putting the handles on it). I love how the navy in the canvas matches my nightstand perfectly, I also made a coral colour, and bought a light pink and gold. 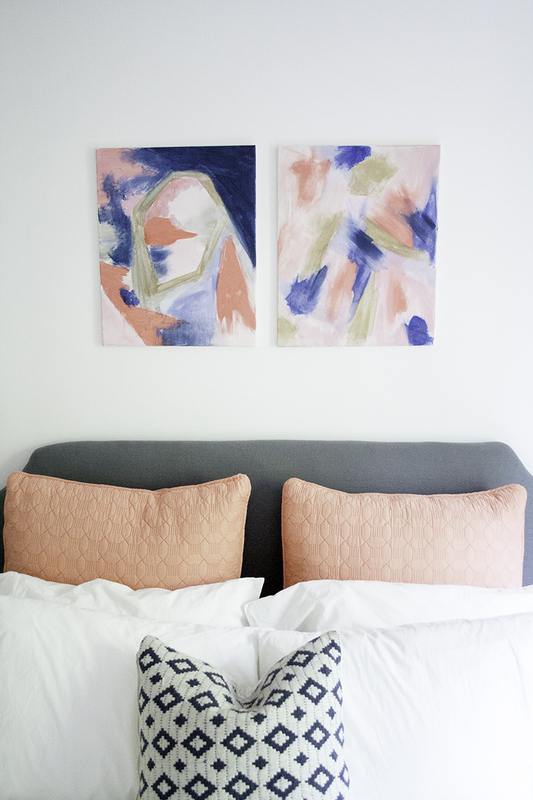 I really think that even if you aren’t artistic, you can definitely pull this off with a little research and some planning and this DIY will actually save you a ton of money, because art isn’t cheap. Paint (you need at least 3 different paint colours. I chose gold, navy and coral because those were the colors in my room. 1. Start by going on pinterest for inspiration, figure out what look you are going for before you start. With a vision in mind it will be a bit easier to get started, but I find once you start it just comes to you and you go with what looks good. 2. 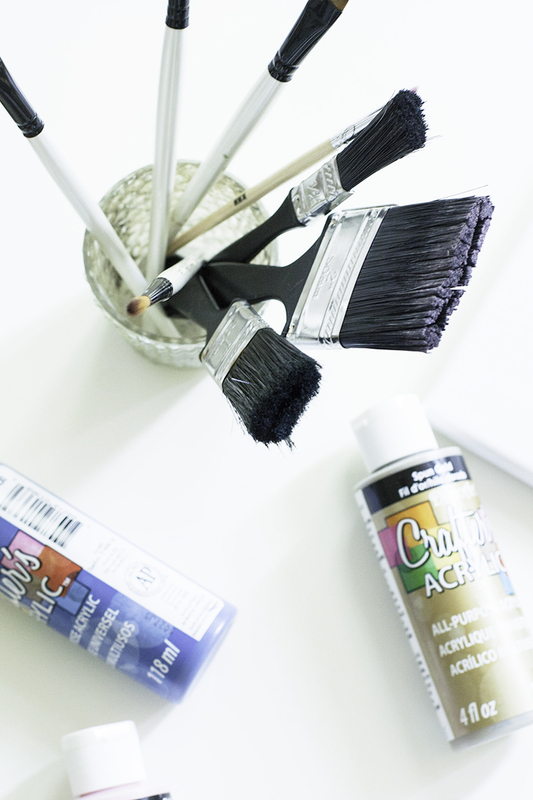 Prepare a workspace with a drop cloth to avoid paint splatter on your furniture. 3. Start with one colour on the canvas. I chose to start with the gold. Make several random lines using different brush sizes on the canvas. Continue using other colours to fill in the spaces around it. You can adjust the shades by wiping away excess paint of the canvas in certain parts to fade the colour, or blend colors. Continue adding lines in different thicknesses and lengths, blending where you can to create a cohesive piece. How do you feel about DIYing? As I mentioned earlier, sometimes it ends up costing more, but is it always about the money or is it about the challenge and fun? I found this article on Huffington post that says to use a flowchart when trying to decide on whether to DIY it or Buy it. Could be a helpful way to decide! Check it out here. I usually wait until I can take the perfect photos of my meals or baked goods before I post them. But I am starting to see that this need for perfection is actually holding me back from posting on this beloved blog of mine. I’m not taking away from the fact that I love photoshoots. I get a thrill from the planning, styling, composing, photographing and editing that goes along with food photography and I will continue to practice these skills every chance I get. But sometimes my best creations happen after work when the sun is low and the photo ops are slim and my iphone is already by my side. So I decided to go ahead and post this recipe on here without a “perfected” photo. That’s ok right? My iphone certainly captures more of my meals than my SLR ever has (anyone who follows me on Instagram knows this). So for anyone wondering, I am basically just giving myself permission to do things a little differently. I am not a perfectionist… nope. I was looking for something quick, light and healthy for dinner the other day, so I though shrimp would be a nice change for a hot summer day. The meal took me 30 min from start to finish, so when I say easy, I mean it, and did I mention they are delicious? Spicy shrimp topped with a crunchy cilantro, lime slaw, some fresh avocado, crumbled feta cheese and a squeeze of fresh lime juice to finish it off? How can anyone resist? I have to confess that I have since made it again and have eaten it about 4 times in the last 7 days. They are highly addictive, you have been warned. 1. Start by peeling and de-veining all the shrimp and patting them dry. 3. Coat the shrimp with the spice mixture and heat a skillet on medium high, add some coconut oil and cook shrimp well, flipping every few minutes until they are cooked through. 6. Heat tortillas on a clean dry pan and toss the cabbage together with some sauce until evenly coated. 7. Assemble tortillas with shrimp, some slaw, some mashed up avocado and a sprinkle of feta cheese on top, a little drizzle of the leftover cilantro lime sauce and a squeeze of fresh lime juice. 8. Enjoy! Try not to eat these more than once in one week I dare you. It’s really starting to look and feel like fall around here. The trees are bursting with vibrant colours and the ground is crunchy with their fallen leaves. All of this is making me really excited to go apple picking and make my favourite comfort foods including this delicious apple and butternut squash soup. I love apples, but my all-time favourite is the Lobo which is actually from the Macintosh family, but grown locally in Quebec. When I go to the orchards I am sure I eat almost half a bags worth before actually filling my bag up. They are tart and crisp and a great choice for snacking and baking. For this recipe I had to go with Macintosh instead, since I am clearly not the only one who loves Lobo’s, they were sold out! I had an idea in the back of my mind that I wanted to bake something using apples, but while walking through the market the other day I saw the most delicious looking plums. They were a beautiful deep purple and perfectly ripe. I thought about how yummy they would be along side the apples, so they ended up coming home with me. After a very food filled weekend in Toronto (celebrating the Jewish New Year) I decided I wanted something a little bit healthier to satisfy my sweet tooth. So here it is! 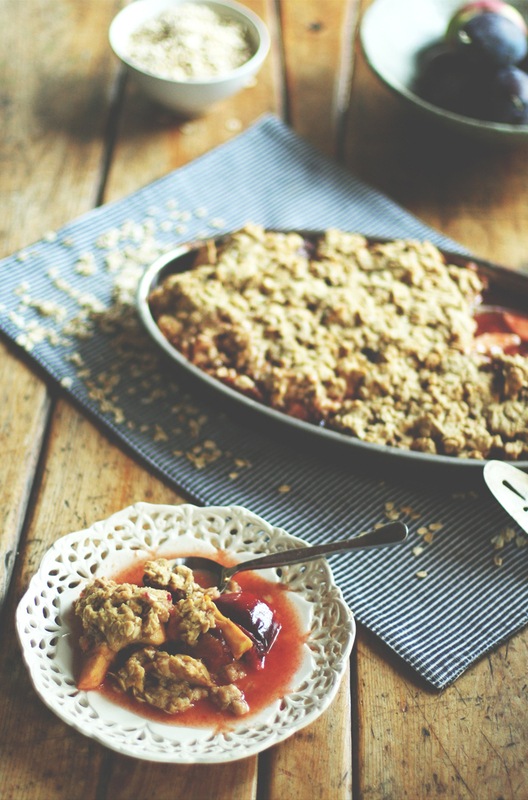 My Plum & Apple crumble. Simple, delicious and on the healthier side (for a dessert). I decided to omit any refined sugars by using maple syrup and swapped out butter for coconut oil. 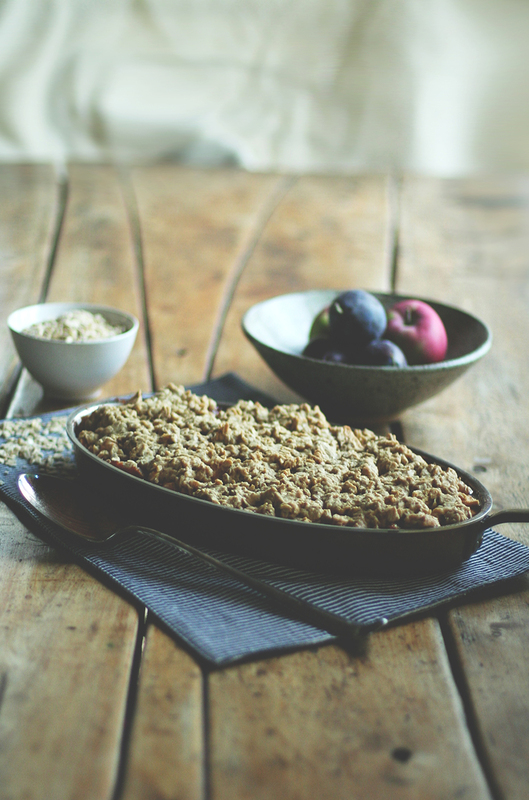 You could even replace the flour with whole grain flour, spelt, kamut, wheat etc… if you want. 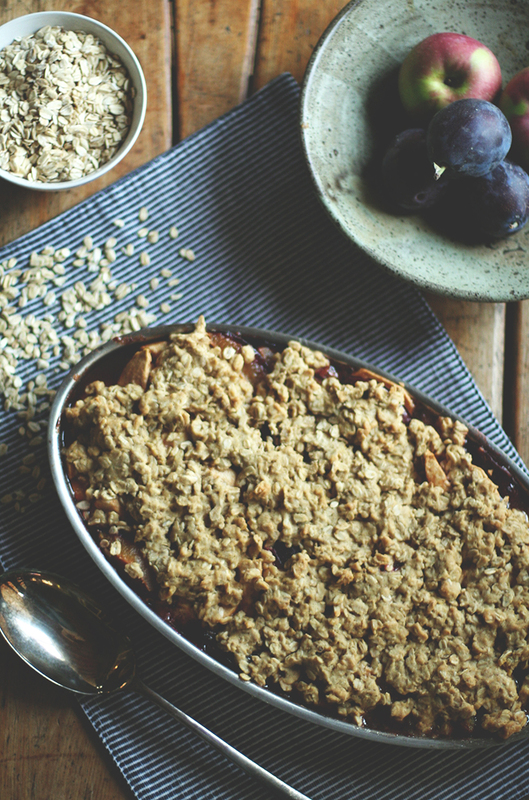 This recipe would be delicious using any seasonal fruits you desire. Peaches, cherries, blueberries, strawberries, rhubarb… the list goes on, but apple is a true classic, and tis the season! 2. Peel, core and slice up your apples. Pit and slice up your plums and put them in a large mixing bowl. Add to this the maple syrup, lemon and orange zest, cinnamon and nutmeg. Combine it all together until all the fruit is well coated. 3. In a separate bowl combine the oats, flour, maple syrup, baking powder and soda, orange and lemon zest and coconut oil together until well combined. The mixture should stick together when pressed into the palm of your hand. 4. 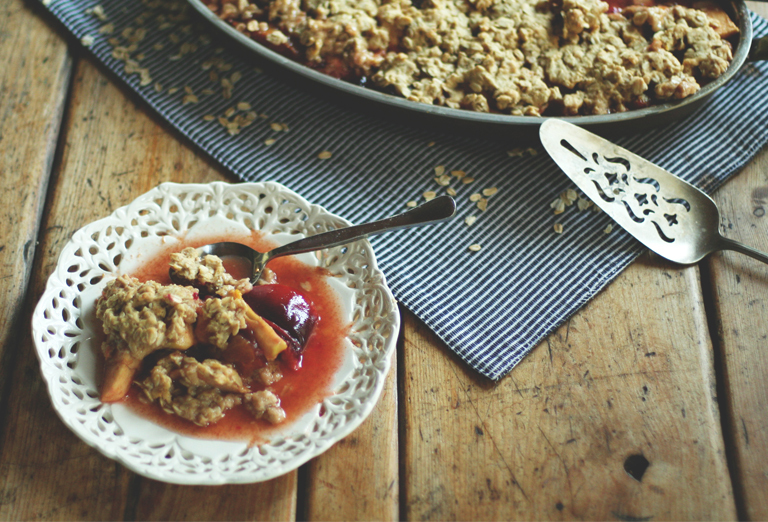 Put the fruit mixture into a large casserole dish, then with a spoon or your hands (if they are very clean) evenly distribute the crumble so that it covers the whole surface of your dish. This s a rustic looking dessert so don’t worry too much about making this part perfect. 5. Bake for about 50 min or until the top is nice and golden brown and the fruits are soft and caramelized. 6. Enjoy on its own or with a nice big scoop of vanilla ice cream! What is your favourite fall recipe? This weekend, I had some friends over for a holiday gift exchange and thought it would be nice to serve up a festive drink for everyone to enjoy. 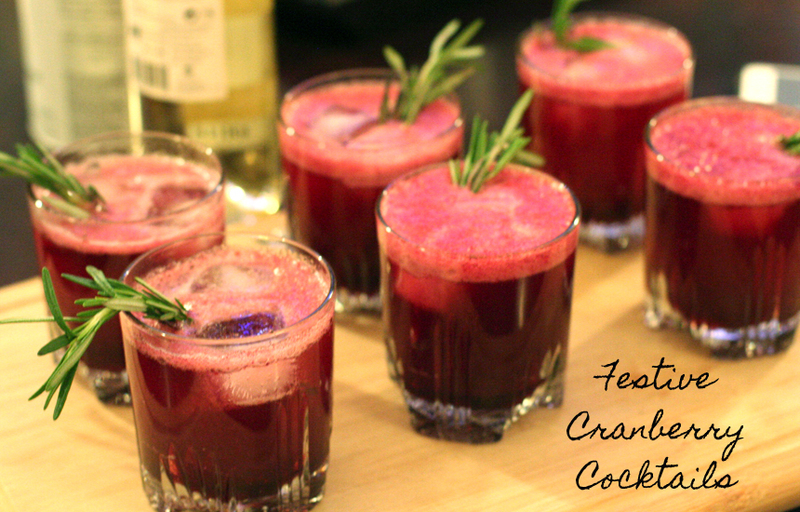 What better festive flavour combination than cranberries and rosemary? The result is a sweet and savoury drink with a bubbly finish! Perfect for a night with the girls. The best part was that all the hard work was done the night before so all I had to do was put it together, serve and enjoy it with my guests! 1. Preheat the oven to 350 degrees. Put the cranberries into a large skillet that is oven safe and set aside. In a medium saucepan combine the wine, maple syrup, brown sugar, lemon zest, whole vanilla bean and seeds, pink peppercorns, and salt and bring to a boil, whisking occasionally. 2. Once the liquid has come to a boil, pour it over the cranberries. Cover the mixture tightly with foil, and bake until the cranberries are soft about 10-15 minutes. Using a slotted spoon, transfer cranberries to a bowl; cover with 1 cup cooking liquid. Let cool completely. 3. Bring 1/2 cup cooking liquid and the 2/3 cup of granulated sugar to a boil in a small saucepan, whisking until sugar has dissolved. Reduce heat to low and simmer until the liquid has reduced and barely coats the back of a spoon. This should take about 6 minutes. Then, pour the liquid through a fine sieve into a medium bowl; let cool completely. Syrup can be refrigerated in an airtight container until ready to use, up to 3 days. 4. Puree remaining cranberries and liquid in a blender then pour through a sieve to end up with a smooth red liquid. 5. To serve, fill 1/4 of the glass with syrup and another 1/4 with puree, stir together, top with seltzer and finish with a sprig of fresh rosemary. Saturday mornings are my favourite. It feels like the reward after a long week. I can wake up a little later and go through my day at my own speed. I decided that I wanted to bake something warm and comforting to enjoy with a hot cup of tea for breakfast. So I pulled out one of my favourite cookbooks; Home Made by Yvette van Boven and decided on biscuits (a.k.a scones). Biscuits are easy to make, delicious, and can be enjoyed with many different meals. They aren’t just reserved for breakfast. They are buttery, flakey and totally addictive and the ingredients are often already in your home which is so convenient. All you need is flour, salt, baking soda, confectioners sugar, butter and milk. Throw everything, except the milk, into a bowl or mixer, and mix until combined but still course and granular. Then add the milk and work it into a ball. Be careful not to overwork the dough and make the butter melt, you want to keep the butter at a chilled temperature, so move fast! Once you have formed a nice ball of dough, sprinkle your work surface with flour and begin to roll it out until it is 3/4 of an inch thick. I then used a drinking glass to cut the dough with. If you have a cookie cutter, that would work too. Once you have cut out all your biscuits, lay them on a cookie sheet lined with parchment paper. Gently brush each biscuit with milk. Then pop them in the oven for 15 minutes at 400 degrees! That is it my friends! How easy is that? I cut them in half as soon as they were hot out of the oven, slathered them with lightly salted butter and a spoonful of Tiptree raspberry seedless conserve, which happens to be my favourite jam, and enjoyed. I seriously could have eaten them all in one sitting but I stopped myself and shared them with my family, who helped me finish them all off in one day! We loved them so much and since they are so simple to make, there is no doubt in my mind that I will be making more of these soon! Preheat the oven to 400 degrees, line a baking sheet with parchment paper and set aside. In a mixing bowl combine all the ingredients minus the milk and mix until butter and flour turn into coarse grains. Work fast so as not to melt that cold butter! Add the milk and work into a smooth ball. Prepare your countertop with a sprinkling of flour and roll the ball of dough out until it is 3/4 of an inch thick. Use a drinking glass (like I did) or a cookie cutter and cut out your biscuits. Keep reworking the dough and rolling it out until you have used up the majority of it. Place them on your lined, or greased cookie sheet and bake until done and golden brown (around 15 min.) Serve with salted butter, jam, whipped cream or clotted cream. Comfort Food: Apple & Butternut Squash Soup. Despite my obsession with summer, I find myself looking forward to the cool crisp air that fall brings. I love dressing for fall, and eating for fall. I start craving comfort foods and begin cooking heartier meals this time of the year. During my weekend trip to the market, I bought a few squashes and decided to use one of them as a side dish, roasting it with butter, brown sugar and cinnamon (Yum). The other one, I wanted to save for a soup. Since apples are also in season (and better than ever), I decided that a roasted butternut squash and apple soup would be perfect choice! 3 Tblsp of good olive oil. 1/2 tsp of good curry powder. 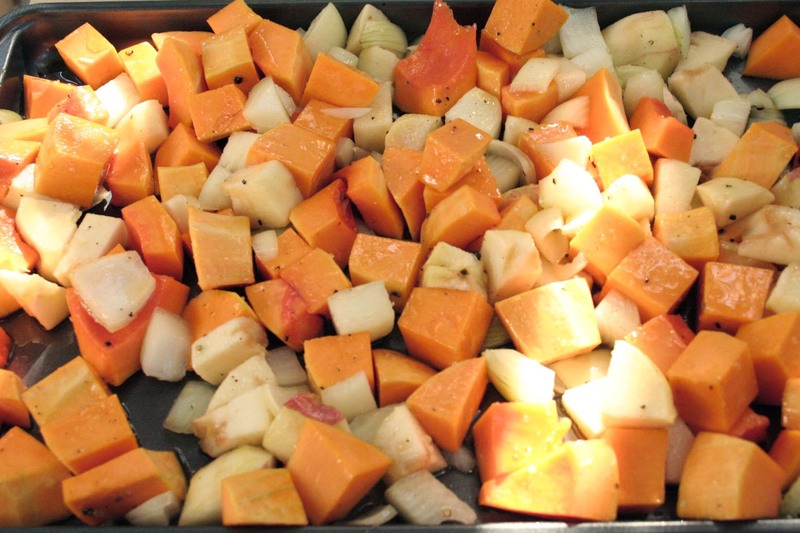 First, Preheat the oven to 425 degrees F.
Then, cut up the butternut squash, onions and apples into cubes and coat them with olive oil and season with a dash of salt and pepper. Spread this mixture out onto 2 baking sheets so that it’s all in a single layer. Bake the mixture for 35-45 minutes, tossing occasionally until very tender. While this is roasting, bring the chicken stock to a simmer and puree the roasted vegetables. To this you will add some warm chicken stock until the veggies are corseley pureed. Place the pureed vegetables in a large pot with enough chicken stock to make a thick soup, add the curry powder, 1 tsp of salt and 1/2 tsp pepper (or more to taste). I Served mine with a dollop of sour cream and scallions on top and it just added that beautiful finished look and flavour to the meal!